A letter of intent (sometimes referred to as a letter of interest) outlines the intent of one party relative to another. These types of letters can be used in a variety of situations including business negotiations, to signal the intent to purchase real estate or by recipients of scholarships or college admissions to indicate the intent to accept a formal offer. In business, a letter of intent is commonly used as an initial proposal to the other party. These proposals may include purchases, acquisitions, contracts and mergers. While not binding, a letter of intent can help clarify the points of a deal or provide protection should a deal collapse. Whatever may be your case, you can use our free Letter of Intent Template as a guide. Continue reading below, where you will find two different sample letters of intent as well as additional tips and resources. 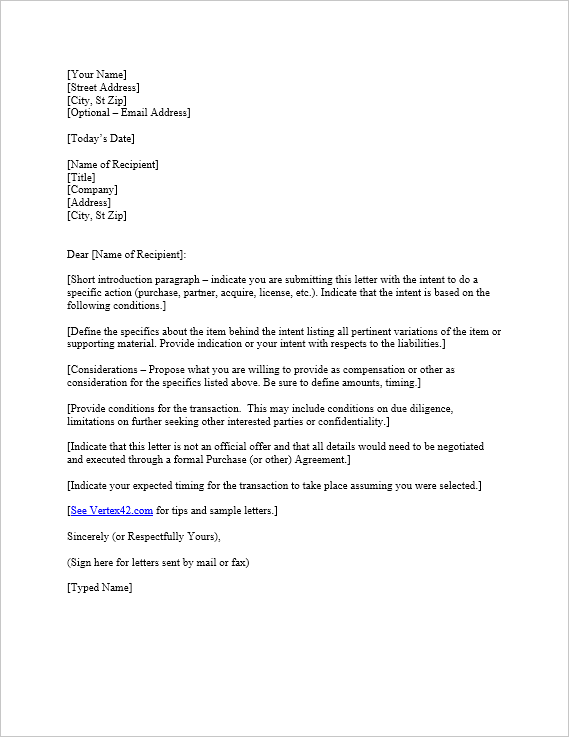 Simplify the process of writing a letter of intent by starting with this template. It outlines the different sections and topics that should be included in your letter. Use a proper business letter format. Determine the name of the correct person to write to. To help ensure the letter is read by the right people, avoid addressing the letter to generic titles or names. Remember, most of the provisions are not binding and are a starting point for negotiations. The letter is part of the business negotiation process. However, some provisions can be made binding such as non-disclosure agreements or a "no shop" provision. Are you ready to purchase a business or large ticket item? This sample letter of intent to purchase is a great example of how to communicate your intentions. We hereby submit a letter of intent to purchase your business Rain Gutters R Us, its inventory and other assets. We envisage that the principal terms of the proposed transactions would be substantially as follows. We would acquire Rain Gutters R Us including its facilities located at 123 Anywhere Street, its logo, brand, brand equity and customer lists. Furthermore, we would acquire all office and field equipment and inventory. 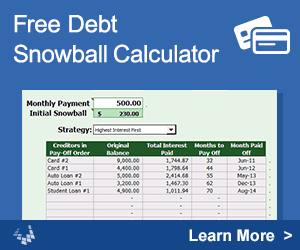 As part of the deal, we would assume the current outstanding debt of $50,000. As part of this letter of intent, we would require that you cease shopping for other buyers for a period no less than 60 days to provide us time to complete due diligence and finalize the agreement. We would also require that you not disclose our intent to purchase until after the purchase agreement has been completed and we can issue a joint press release. This letter is not an official purchase agreement. All of the terms and conditions of the proposed transaction would be stated in the Purchase Agreement, to be negotiated, agreed and executed by both parties. If we are selected as a prospective buyer, we anticipate that from the selection date to the closing will take no more than 45 days. Did you just receive a scholarship offer to your favorite university? This sample letter shows you how to formally accept that dream offer. I wanted to confirm to you in writing my intent to accept the football scholarship offered to me by Awesome University. I am excited to put on the colors of the fighting lobos and begin practicing with you this fall. Please send me information that will help me get ready for the season including information about enrollment, housing and training. If you have further questions, I can be reached at (123) 456-7890. Thank you again for this opportunity and I look forward to seeing you again this summer. Sample Letter of Intent for Acquisition - iastate.edu - This one includes various legal provisions. The sample includes a detailed explanation. Sample Letter of Intent for Graduate School - nyc.gov - Example of how to write a letter of intent to attend graduate school (submitted along with the graduate school application). National Letter of Intent (NLI) - ncaa.org - An NLI is used to prohibit other schools from recruiting a student that has signed a letter of intent to accept a scholarship at a specific school. The NLI is sent to you by the school.